Global Citizen Line Up Announced !!! 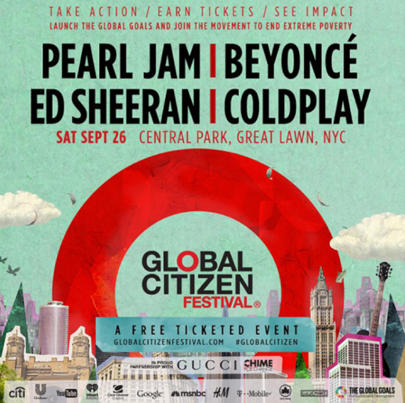 Beyoncé, Pearl Jam, Coldplay and Ed Sheeran will perform at the 2015 Global Citizen Festival on the Great Lawn of New York’s Central Park on Sept. 26. Beyoncé made a surprise appearance onstage last year when Jay Z closed the free event. The fourth annual concert will air on MSNBC and stream on iHeartRadio and Tidal. Past performers include Stevie Wonder, Neil Young, Alicia Keys, Foo Fighters and Carrie Underwood. Fans can earn free tickets by taking actions to end poverty on globalcitizen.org. The concert is timed to coincide with the U.N. General Assembly meeting.